These Nutella Cookies were created by my friend Louise, who made some modifications to a cookie recipe originally from Bill Yosses. If you recognize the name, it’s because he’s currently Chef at The White House where dessert is supposedly a rarity and the focus is on more wholesome treats like Fruit and Oat Bars. This is one of his older recipes. The original version called for hazelnut paste. Louise’s Nutella Cookies call for Nutella in place of the hazelnut paste and slightly different proportions of butter and sugar. If you’ve baked with Nutella, you know the flavor is barely perceptible in small amounts, but it does add a shiny dark hue to the cookies plus extra sweetness and chewiness. The hazelnut flavor, again, is subtle, but if you want to ramp it up you can use hazelnuts and use something like Lindt or Rittersport bittersweet chocolate with hazelnuts added. That, or add some hazelnut extract, which I’ve never tried but have heard about. I think King Arthur sells it. Preheat oven to 375ºF. Line 2 baking sheets with parchment paper. Mix the flour, baking soda and salt together and set aside. In the bowl of a stand mixer fitted with a paddle attachment or in a large mixing bowl using a hand-held electric mixer, beat the butter and both sugars until creamy. Reduce the speed to medium-low, then add the Nutella and beat until smooth. Add the egg and beat until it’s mixed in, then add the vanilla. Reduce the speed to low. Gradually add the flour mixture, beating just until the dough comes together. Stir in the chocolate pieces and, if desired, the nuts. Using a tablespoon, scoop up heaps of dough and put them on the baking sheet, spacing about 3 inches apart. Bake one sheet at a time for 10 minutes or until cookies look set. Transfer the sheets to a wire rack to cool for at least 10 minutes. I actually like them best chilled, but maybe that’s because it’s 104 degrees and everything seems better chilled. I'm not sure of the exact number of cookies yet. Mmmm sounds good! I love Nutella! I have been trying to find time to experiment with lots of different Nutella recipes. One of my teens could eat Nutella by the barrel 🙂 So, I’m going to have to try these. They look delicious! you need a break from all the heat. i’ve seen how hot it is where you are. awful. and you have humidity too? Gloria- The thing about these cookies is that the hazelnut from the Nutella is not a noticeable taste. I definitely wouldn’t use molasses as Bill Yosses’ original recipe, which appeared in The New York Times “The Chef; A Smarter Cookie” on Nov. 28, 2001, called for unsweetened hazelnut paste or peanut butter. The Washington Post article from Dec. 8, 2010 substituted Nutella. I looked at the fat and sugar content of hazelnut paste, almond paste, and Nutella. That’s when I bumped up the butter by barely one tablespoon and minimized the brown sugar a bit. And I think it needs nuts and bittersweet chocolate to counter the additional sweetness of Nutella. The result is an excellent cookie with great keeping quality, which most cc cookies don’t have. Gloria, I think molasses would be too sweet and have too much flavor in those proportions. You could add a little, though. Lisa, I love Justin’s Almond Butter but haven’t seen their hazelnut. I’m going to look for it today. I recently bought a jar of Justin’s chocolate hazelnut butter, which I think is delicious. They use drastically less sugar than Nutella and that results in a more pronounced hazelnut and chocolate taste. It might be a good sub in this recipe, but with only two tablespoons added, the hazelnut flavor probably won’t stand out much more. This looks like a very good recipe, one I’d like to try sometime. These cookies look good, but I am not a hazelnut flavor fan. Would adding molasses work the same? What?! Now Nutella cookies?! It’s like you’ve taken all my weaknesses and made them into cookies! This cc cookie has a couple of great things going for it, besides tasting really good. Supposedly the Nutella adds to their keeping quality, so I put several in a tin and have been trying one per day. Two days out and they are still very good and also chewy. I agree with Anna that they need to be absolutely cold. I ate one shortly beyond the ten minutes out of the oven and it seemed like there was no texture beyond chocolate. The chewiness seems to be acquired when they are thoroughly cold. From a Washington Post article, it seems like you can get a crispy cookie with longer baking, but I don’t really care for cc cookies that way, so I went with the shorter baking time. 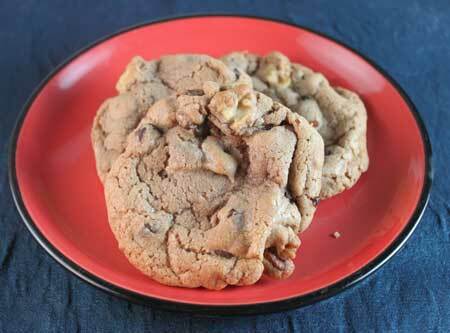 The other great thing about this cookie is that you stir it up and bake it right away. Most of the great tasting cc cookies need to be refrigerated overnight and I appreciate that you don’t have to plan ahead. Yum I love Nutella too- I would probably spread some of it on tip of these cookies! I was just thinking how I wanted to use Nutella in baking…love it. I wasn’t aware that dessert was a rarity at the White House, those poor children. I betcha all those chefs are missing the Clinton years about now :). And I need to check in with Nutella again, I’ve never liked it, but the more I see recipes the more I’m curious about it again.